The Anaconda Wave Converter system was invented in 2005 in conjunction by Professor RCT Rainey (WS Atkins Oil and Gas) and Professor FJM Farley (Maritime Energy Development Limited). The licensed manufacturer of the wave converters is CheckMate SeaEnergy Limited. The Chief Executive of Operations is Des Crampton. What is so novel about the Anaconda wave converter in respect to previous devices is that the predecessors did use flexible membranes or tubes oriented in the direction of the waves, but none completely depended on the distensibility of a tube made of a rubber-like material. The group aimed at having a full prototype in the water in 2014, but the paper trail on the Anaconda goes cold in late 2008. It can be best assumed that they are still looking for investors for the project3. The Anaconda wave converter technology is a relatively system. 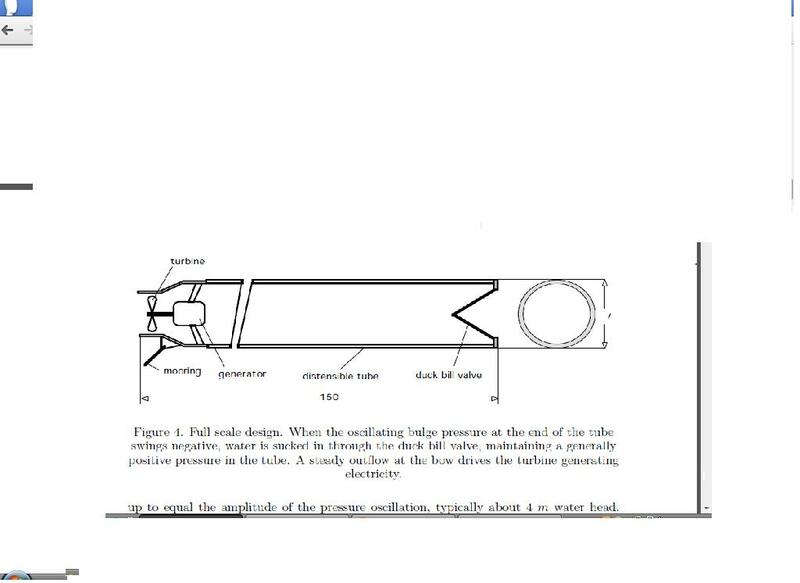 It is a long tube made of rubber with a polymer coating that can help it stand up to the corrosive environment of the ocean(more info:http://www.drvalentinheller.com/Dr%20Valentin%20Heller_files/Heller_Case%20study%20Anaconda.pdf). At the end of the tube, there is a turbine, valve, and accumulator that all work to smooth out the flow of water to make the energy more consistent going through the turbine. The bulge in the wave is moved or oscillated by the movement of the water for the wave passing by. 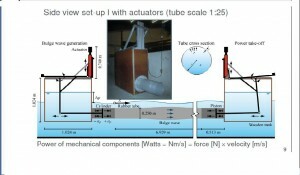 As the water moves through the tube, the kinetic energy is stored in the surface area of the converter and is passed along the device (more info:http://www.bulgewave.com/anaconda.pdf). Installation of the devices is relatively simple. The device can be coiled up and carried as simple cargo on a ship to it’s destination, once there, the front of the device is simply moored to the sea bed while the rest of the machine floats. The device is aligned so that the tail end of it is pointing in the direction of the wave flow. The Anaconda functions best in water where the annual average incident wave power is at least 50kW/m. Much of the work on this project seems to be in a stand still. It can only be speculated that this is because of a lack of funding/ interest in the project or the international patent process on the technology (more info:http://www.hydralab.eu/hydralabIII/proceedings/DHI-3_Chaplin.pdf/http://www.middle-east.atkinsglobal.com/~/media/Files/A/Atkins-Middle-East/Attachments/sectors/renewables/library-docs/papers/development-of-the-anaconda-all-rubber-wec.pdf). The cost of building one unit of a bulge device would be 1.5 million dollars. Energy costs are expected to lower in the UK if these bulge devices are implemented into the power grid. Costs for energy are predicted to change from 38 cents per kW/h to 14 cents per kW/h (Renewable Energy Focus, 2009). Lowering chances of maintenance could help the bulge device become more economically favorable. Environmental damage should be significantly lower due to the rubber that consists of most of the anaconda. Aneurysms in the tube could cause problems with both creation of energy and maintenance needs to fix the issue(Bucchi, 2013). There will be lower potential maintenance costs by lowering the possibility of aneurysms occurring. Many environmental concerns can be attributed to the bulge device, like most renewable energy devices. Noise, electromagnetic fields, and energy loss through avoidance could effect the marine life in the vicinity of the Anaconda. Scientists have suggested adding smaller bulge devices near offshore wind farms which could fix many of these issues(Shaw, 2011). The same power line connecting the wind farm to the grid could be shared by the bulge converters, rather than creating a new line, lessening the effect on marine life. The location would also be shared with the wind turbines, an already human influenced area, causing no new environmental damage concerns. Farley, Francis J.M., and R.C.T. Rainey. “Anaconda: The Bulge Wave Energy Converter.”Maritime Energy Developments. Maritime Energy Developments Ltd., 5 Nov. 2006. Web. 16 July 2013. <http://www.bulgewave.com/anaconda.pdf>. Chaplin, John R., Francis J.M. Farley, Grant E. Hearn, Valentin Heller, and Antonio Mendes. “HYDRODYNAMIC PERFORMANCE OF THE ANACONDA WAVEPOWER DEVICE.” HydraLabIII. HydraLabIII, Feb. 2010. Web. 16 July 2013. <http://www.hydralab.eu/hydralabIII/proceedings/DHI-3_Chaplin.pdf>. Heller, Valentin. “Case Study: Ananconda.” Imperial College of London. Imperial College of London, 20 Jan. 2012. Web. 16 July 2013. <http://www.drvalentinheller.com/Dr%20Valentin%20Heller_files/Heller_Case%20study%20Anaconda.pdf>. Chaplin, J.R., F.J.M Farley, M.E. Prentice, R.C.T. Rainey, S.J. Rimmer, and A.T. Roach. “Development of the ANACONDA All-rubber WEC.” N/A. 1Dept. of Civil & Environmental Engineering, Southampton University, UK; 2Maritime Energy Developments Ltd, Le Bar Sur Loup, France; 3Avon Fabrications LLP, Melksham, UK;4Atkins Consultants Ltd, London, UK;5SJR Consulting Ltd., Melksham, UK, n.d. Web. 17 July 2013. <http://www.middle-east.atkinsglobal.com/~/media/Files/A/Atkins-Middle-East/Attachments/sectors/renewables/library-docs/papers/development-of-the-anaconda-all-rubber-wec.pdf>. Hearn, Grant E., and Andrea Bucchi. 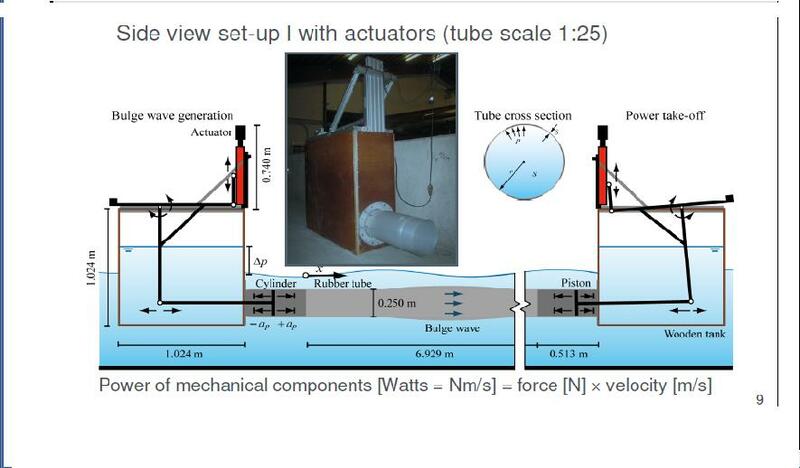 “Anaconda- Wave Energy Converter.” Fluid Structure Interactions Research Group. University of Southampton-School of Engineering Sciences, 2011. Web. 17 July 2013. <http://www.southampton.ac.uk/assets/schools/ses_posters//Bucchi_Andrea.pdf>. 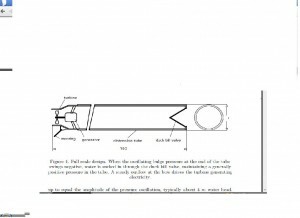 Patent Scope, 2007, “DISTENSIBLE TUBE WAVE ENERGY CONVERTER.” Patent Scope. World Intellectual Property Organization, 8 Sept. 2007. Web. 24 July 2013. <http://patentscope.wipo.int/search/en/WO2007088325>. Great Britain. “UK Patent Application.” Intellectual Property Office. Government of Great Britain, 14 Jan. 2009. Web. 24 July 2013. <http://www.ipo.gov.uk/p-find-publication-getPDF.pdf?PatentNo=GB2450914&DocType=A&JournalNumber=6243>.